Are you planning a trip to Secrets Marquis Los Cabos? For an exciting day trip, consider whale watching. 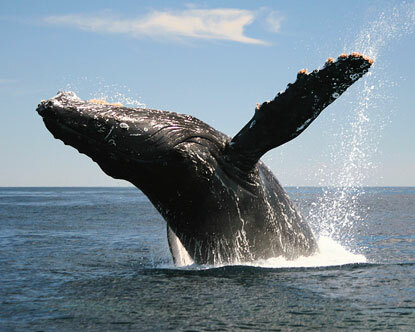 The area just off the coast is home to one of the world’s greatest creatures– the Humpback Whale. The deep, warm Pacific Ocean is perfect for these gorgeous mammals to breed and Cabo has become one of the best whale watching places on the coast. January through March is the best time to plan a whale watching adventure in this area. During these few months, the Humpback Whale migration to Mexico leads hundreds of whales to the warm waters where they breed and give birth. This means you could possibly see mother whales with her calves. In addition to whale watching, you will also have a good chance of seeing dolphins, sea turtles, stingrays and other sea creatures. These are always considered a “bonus” and never a given but are definitely a great perk to the trip when spotted! Whale watching season is winding down — make sure you visit soon for a chance to see these magnificent creatures! This entry was posted in Secrets Marquis, Secrets Resorts & Spas and tagged Activities, Los Cabos, resort activities, secrets marquis los cabos, Whale Watching. Bookmark the permalink. the employee in the store where you bought your home cinema from. hospital on a TV program where he explained this health hazard. it for yourself or someone else, making these rings is quite satisfying endeavor. The prices for the items on this site vary depending on the variety chosen. natural sugars than above ground veggies. vacuum assembles in the clean up process. What is the most ideal lightweight carpet vacuum cleaner.